RJ Gators, The Villages, FL. 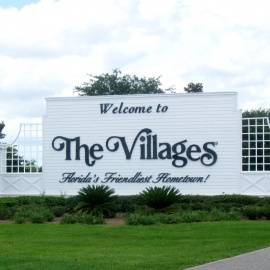 The Villages� is a premier active adult retirement community located in North Central Florida, specifically for ages 55 and up. It spans three counties, three zip codes and over 20,000 acres. It's connected to over 100 miles of golf cart streets and trails and is entirely self-sustaining with retail, restaurants, banks, post offices and healthcare providers. Retirees have flocked to this popular destination because of the warm weather, amenities and free golf for life.